Paul Thompson, with Sheffield Steelers' forward Robert Dowd during last November's clash with Nottingham Panthers. Picture: Dean Woolley. 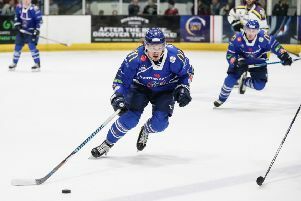 WHILE news of Robert Dowd’s return to action for Sheffield Steelers will clearly be welcomed by all connected with the club, head coach Paul Thompson believes there was one player in particular who had an extra spring in his skates during training yesterday. The decision was only made in the afternoon on whether Dowd could be given the green light to return after missing the last 16 games with a lower body injury. Sheffield Steelers' forward, Robert Dowd. Picture: Dean Woolley. And Thompson believes that the 27-year-old British winger’s inclusion on the Steelers’ roster for the first time since January 16’s 5-4 home win over Nottingham will have a positive impact on his line-mate, Levi Nelson. Prior to Dowd’s absence, Thompson had been impressed with the positive chemistry between the two, something he hopes can be rediscovered as Steelers attempt to retain their Elite League title with just five games remaining. “He’s a positive influence both on and off the ice and I feel that he, (Freddie) Vestberg and (Levi) Nelson have previously worked really well together. Sheffield Steelers ' Levi Nelson. Picture: Dean Woolley. Dowd’s first task tonight will be to help the Steelers overcome a Fife Flyers team in pole position for their first ever Gardiner Conference title, improving on them twice finishing runners-up and giving them second seeding for the play-offs at the end of March. “Fife have got everything to play for,” said Thompson, about a team with eight wins from their last 10 games and who host the Steelers on the final day of the regular season on March 20. “Make no mistake, as we saw in the Challenge Cup, we are up against a very good team who are striving to win their Conference. If they do that, they then match up against seventh in the play-offs and they have a massive game on Sunday night too, so this is a big weekend for them. “But, as I was reminding my players in training, there’s a good reason why we are at the top end of the table and that’s because we are a very good team too. “So we’ve just got to play at the top of our game because there are absolutely no excuses now.